Separator uses specially impact baffle separator element to direct the downward discharge of a Ejector Venturi Gas Scrubber through a turbulent 90 degree bend of direction into a sidewall. There, an inertial separation occurs as the impacted liquid drains downward and the gas stream, free of liquid, reverses its direction and heads out of the separator through a nozzle located opposite to the region of liquid-air impact. Fully customized, complete engineered solution. Versatile, flexible and expandable. Tolerates system upsets. 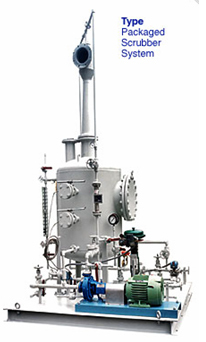 The Separator is recommended whenever space for gravity separation is not possible, desirable, or combined discharge of the liquid gas streams is undesirable. The continued contact through the impact baffle aids scrubbing efficiency. The unit is more compact than a gravity or cyclonic separator. Units can be designed with or without liquid storage capacity.